Never Mind the Pollacks was the second of Neal Pollack’s swaggering, impertinent, scene-crashing impersonations. His first was the send up of testosterone-sodden literary pomposity, The Neal Pollack Anthology Of American Literature. (Not gracing your bookshelf? Goodness gracious. The book is a cavalcade of brilliantly crafted bookish smart-aleckery. A total delight. Treat yourself…really.) 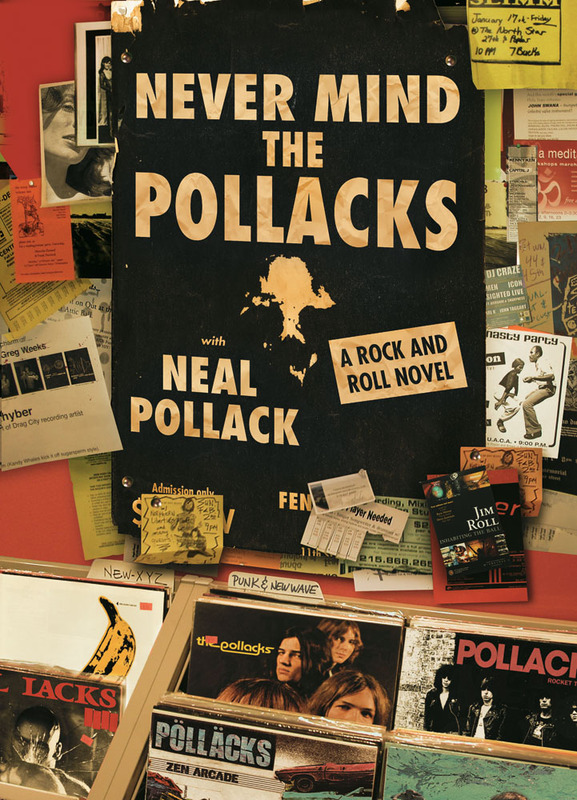 In Pollacks, he hijacks the persona of beloved rock critic Lester Bangs and proceeds to stumble and careen through decades of rock history, lore, and criticism, knocking all sorts of precious things off the shelf along the way. The concept for the cover—that it would mimic visually the gleeful cultural vandalism of the novel—was instant and self-evident. The joy was in crafting this layered concoction of homages, appropriations, shout outs, inside jokes, and obsessive rock geekery. It began with the title poster. It’s a riff on the legendary “Rock Hotel at the Ritz” show posters that blanketed the Lower East Side of New York City in the mid-80’s. 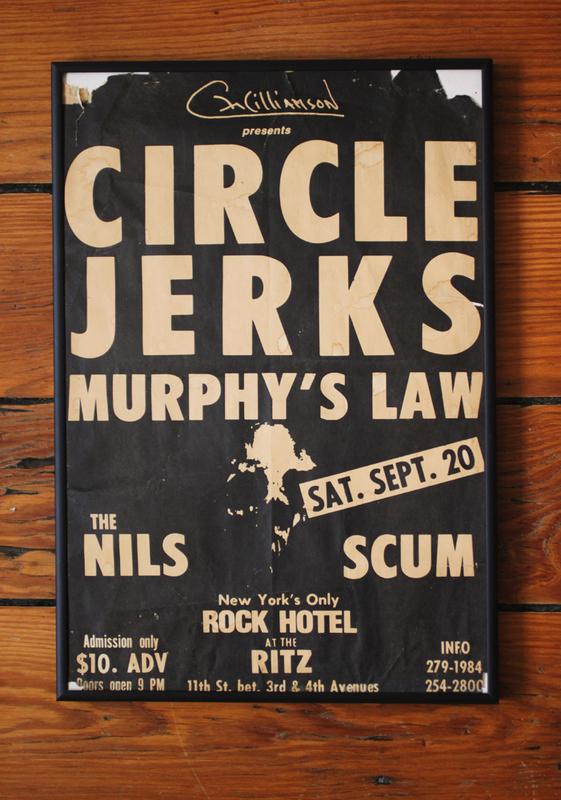 I snagged a freshly-pasted one back then—a great bill, too: Circle Jerks, Murphy’s Law, the Nils, and some forgotten basket case known as Scum. It has hung in my studios ever since. I think Neal suggested the Pollack-ing of punk rock’s finest. We eventually settled on The Velvet Underground & Nico, Black Flag’s Damaged, The Stooges, Ramones’ Rocket To Russia, and Hüsker Dü’s Zen Arcade. Nirvana’s Nevermind is peeking out from the edges. From a punk rock train-spotting perspective, it still feels like a solid roster. I especially like how they’re all American bands. Don’t remember if that was intentional, but it’s a nice, Midwestern, bratty, chauvinistic move. To this day, I’m embarrassed that I had to buy the Stooges record for the shoot. Shame. Amidst the surrounding tangle of flyers is a crucial shout-out: The postcard for Jim Roll in the lower right hand corner of the cover. Jim Roll is a deeply talented musician, songwriter and producer from Ann Arbor, Michigan. 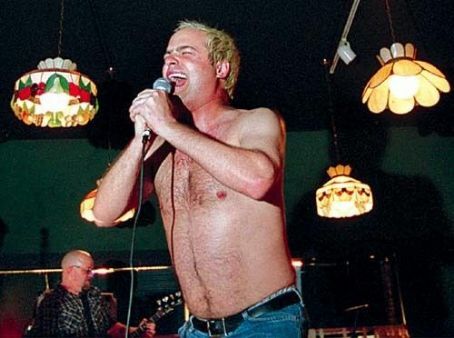 He is the musical engine behind the Neal Pollack Invasion—formed by Neal in homage to the record Lester Bangs released with the Texas band the Delinquents. He’s also the reason Neal and I came to work together in the first place. I was in the music business at the time, having founded the label the Telegraph Company with some pals in the mid-90s. Jim had this amazing record, Inhabiting the Ball, that he had recorded, for which authors Rick Moody and Denis Johnson had contributed lyrics. (Stop now, spare a moment, and pick up a copy. It’s a treasure.) Telegraph was releasing it and on a whim we contacted McSweeney’s, the journal founded by David Eggers, asking if they wanted to co-release/endorse the records. Sure, came Eggers’s response, and when we asked him if he would write the liner notes he graciously demurred and offered up Neal, who, as he put it, could really use the money. Later, when Neal came up with the whole Never Mind the Pollacks idea, he got in touch. Telegraph released the record, HarperCollins the book, and I did the artwork for both. The vignette on the back of the book is among my favorite of pieces I’ve produced—I had a blast composing, shooting and mocking up this little Jenga stack of references. 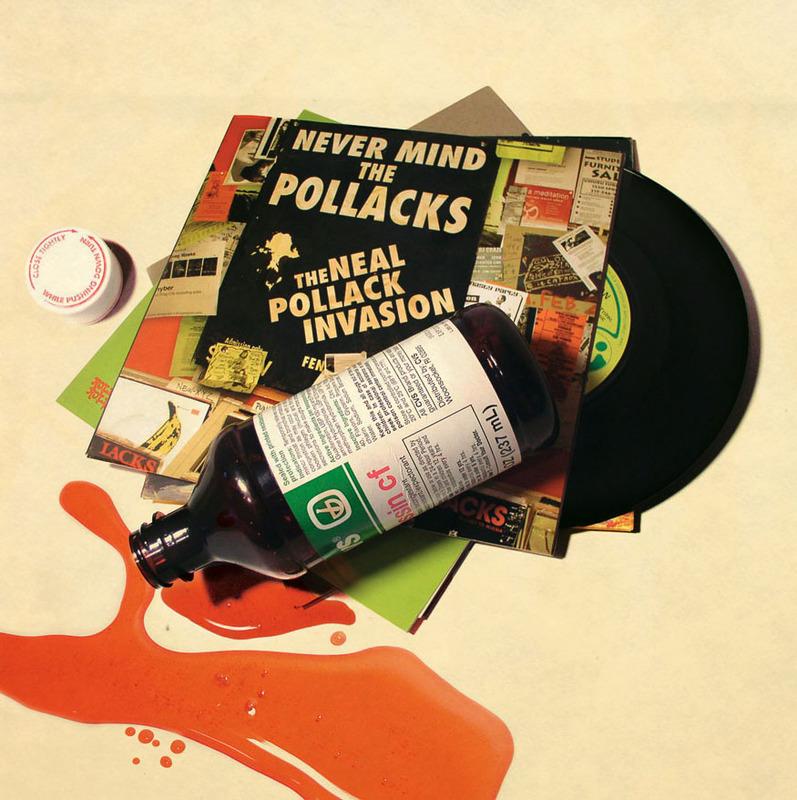 The 7″ sleeve is the artwork from the aforemetioned Never Mind the Pollacks record. The label peeking out on the 45 is that of the famed Harvest Records. Harvest was a glorious oddball of a label, nominally EMI’s prog rock imprint—releasing stuff like Syd Barrett-era Pink Floyd, and my beloved, mighty Move, just as they were morphing into the Electric Light Orchestra. Weirdly though, in the late 70’s, they began signing a singular string of punk and post-punk bands: Wire, Undertones, and Duran Duran. They also released the first few Iron Maiden records in the U.S. Obviously, that kind of cultural stewardship deserved a salute. The viscous slicks of CVS generic cough syrup, are, of course, meant to evoke Romilar, the hypnotically hallucinogenic cough remedy that both Lester Bangs and Neal Pollack swilled by the gallons. All in all, this project was a total gas. The book is hilarious, acerbic, yet soaked in affection and gratitude, I think, for all the weirdness and satisfaction left-of-the-dial rock can give. Putting together the artwork, releasing the record, all that—total pleasure. No one should have that much fun while working. The Neal Pollack Invasion played actual shows. Songs and everything! The book even came out in German. And, of course, the result of all this did Lester Bangs’s legacy proud—dollops of critical acclaim and fervent fandom in a vast soup of mass indifference. Just like all the records on the cover. I don’t know that I have a ton more to add to what Shep has already written; I was doing a lot of drugs that year and his memory is way better. But I do need to thank the people who were working for HarperCollins back then for giving me a wide berth on the book cover. So much cover work gets done in-house, and while some of it is quite good, a lot of it feels boilerplate. The potential for disaster with an idiosyncratic project like Never Mind the Pollacks was very high. Instead, they let Shep run away with his imagination. I wanted something authentically “punk rock” which reflected the tastes and outrageous prejudices of my main character. Also, in the book’s opening scene, “Neal Pollack” staggers into a Brooklyn record store and chews out the clerk for not being indie enough. I like to imagine that the extraordinary image that Shep cooked up was somehow part of that scene. NMTP either never got the credit it deserved, or it got EXACTLY the credit it deserved, given that it was a novel satirizing an obscure topic that only broke people care about. I’ve got nothing left from my rock-n-roll days except about 100 bumper stickers and a lot of hazy memories. That said, the Neal Pollack Invasion will be making its return next year to celebrate its 10th anniversary. Austin-based label Chicken Ranch Records will be re-releasing the “soundtrack” to the novel, both in digital and limited-edition vinyl form. We’re going to play at South By Southwest and a VERY short tour will follow.